The strange tremor in the open source force that you may have just felt was a thousand Ubuntu fans cheering at the news that Canonical has officially presented the tablet interface. Billed as a step towards unifying personal computing on phones, tablets, PCs and TVs, Ubuntu guru Mark Shuttleworth insists that this is the future of computing. Ubuntu for phone launched back in January, with handsets expected by October - and now that small screen experience has been maximised. 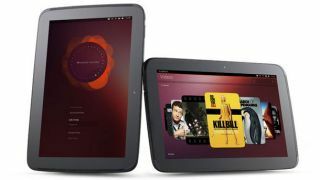 The Linux-based Ubuntu tablet interface allows multitasking, and will even let you put a phone app on screen at the same time as a tablet app – with side stage created to improve small screen apps on our slates. There's full multiple account support – useful for households that share and share alike but still want their own stuff to stay private. Also on the feature list is a unique heads up display (HUD) that can apparently be voice controlled. Siri-ously. We're liking the sound of Edge Magic, although this is less about sawing someone in half and more about using the borders of the tablet to navigate between apps. This does away with the need for physical buttons. Last, but clearly not least, this is a fully convergent interface that will stay consistent across any device. The tablet interface supports devices from six to 20-inches with resolutions between 100 and 450ppi, so expect to see it on an open source fan's tablet soon.